In 2011, San Diego Food Bloggers banded together to participate in the Great American Bake Sale to raise money for Share Our Strength, a 501(c)(3) charity with the goal of creating an accessible way for people to get involved in ending childhood hunger. 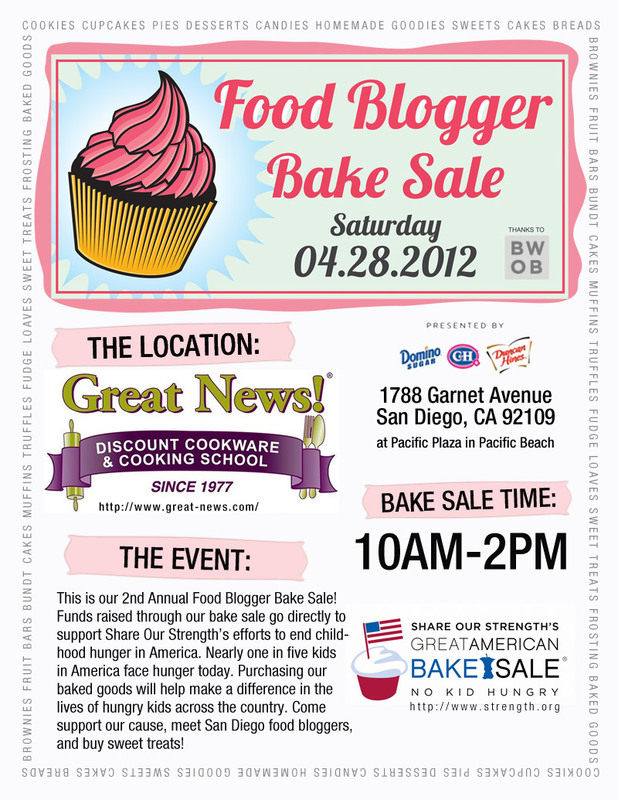 Last year’s San Diego Food Bloggers Bake Sale had 32 local bakers participating and raised $1750 for Share Our Strength. This year’s goal is $2500, so plan to come out this weekend, buy some fabulous locally produced baked goods, and join in the fight against childhood hunger along the way! Our sale will be on Saturday, April 28, 2012 from 10am – 2pm and will be hosted again this year at Great News! Discount Cookware and Cooking School in Pacific Beach. You can find more details on the SDFB Bake Sale site, as well as a menu of goodies from bloggers that were actually on the ball enough to decide ahead of time. And yes, although I have only posted four times in the last 8 months, San Diego Food Bloggers have been kind enough to let me tag along and participate anyway, so there will be no shortage of boozy cakes and chocolate peanut butter goodness on the bake sale tables! One of the things holding my attention lately was a trip north to Seattle. Home to a city of food and drink enthusiasts, i’s a fantastic destination for anyone passionate about craft beer, local food, and painstakingly researched cocktails. 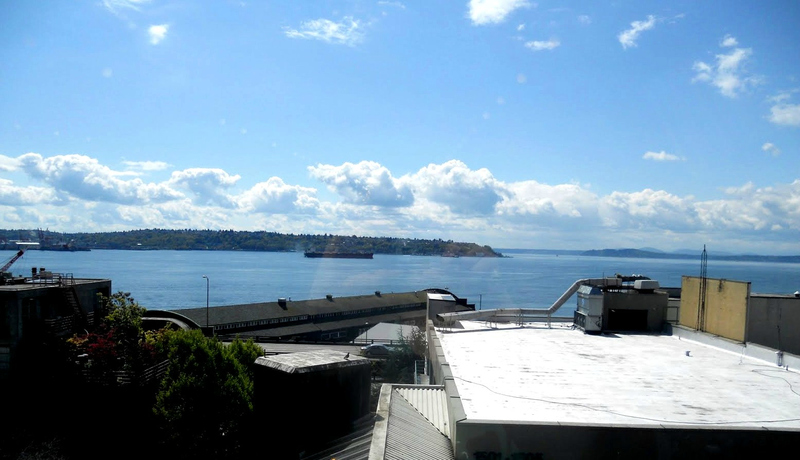 If you haven’t been to Seattle, or haven’t been lately, now’s the time to plan a trip: summer in Seattle offers an occasional respite from the rain and clouds, and non-stop flights from San Diego can be found for around $200. Hope you all enjoyed a relaxing Memorial Day weekend, because the season for food & drink events in San Diego is upon us! The next six months are already chock full of fun things to do, from the San Diego Spirits Festival, International Beer Festival, and San Diego Festival of Beer, to CityFest, San Diego Restaurant Week, and the San Diego Bay Wine and Food Festival, with more great events on the way. “But Ish!” (I hear you ask) “Where can I go to find out more about fabulous San Diego food events?” “What if I’m planning a trip and lack Googling ch’i?” Fear not, readers – just go to our Food Events page for regular event roundups plus calendars of major events in San Diego and beyond! 9am-11pm. Get a cultural start to the weekend at this year’s Lebanese Festival! This three day festival includes Lebanese food (kebbeh, tabbouleh, hummus, grape leaves, kafta), musicians, and cultural performances, including dabke (literally “stamping of the feet” in Arabic), an extremely popular folk dance performed at weddings and other celebrations. Complete festival schedule and list of vendors/performers at www.lebanesefestival.net. 10am-7pm. The Santee Street Fair gives you another reason to venture east with over 300 vendors, plus rides, music, and wine & beer garden. http://santeestreetfair.com. If you were one of the many that missed out on this morning’s Veritas 009 release at The Lost Abbey, why not console yourself at Vintage Bottle Weekend at O’Brien’s Pub? Event includes limited vertical flights, including a 7 year vertical of Fuller’s Vintage Ale (2004-2010), a 4 year vertical of Unibroue’s anniversary ales, and vintage bottles such as 2008 North Coast Old Stock Ale, 2008 Rodenbach Vintage, and 2009 Lost Abbey Cuvee de Tomme. 10am-5pm. Celebrate the 31st Ethnic Food Fair at Balboa Park’s House of Pacific Relations International Cottages. Event features food for sale from over 32 nations, as well as ethnic music and dance, costume, and cultural presentations. Click here for a complete list of entertainment, participating groups, and food for sale, and someone please save me some alfajores. And, okay, some varenyky and galabki while you’re at it. If you happen to find yourself in North County instead (or just fear the crowds at Balboa Park), head over to the Strawberry Festival in Vista and celebrate all things strawberry from 9am-4pm with music, costume and pie-eating contests, vendors, food, dance, art, fashion shows and more. Once you’ve had your fill of strawberries, swing by Green Flash Brewery’s Vista location and say goodbye to the old brewery at their Relocation/Customer Appreciation Party from noon to 4pm. Enjoy complimentary food, prizes and beer as the company looks forward to the opening of their new Mira Mesa location next week. This Monday is Memorial Day, a day we pause to remember all those who have gone before, particularly those who have given their lives in armed service to the United States. Several memorial events are scheduled throughout San Diego County; you may notice that the flag is lowered to half mast, but only from dawn until noon. “The half-staff position remembers the more than one million men and women who gave their lives in service of their country. At noon their memory is raised by the living, who resolve not to let their sacrifice be in vain, but to rise up in their stead and continue the fight for liberty and justice for all.” At 3pm local time, a national moment of silence is observed throughout the country. Operation Gratitude seeks to lift morale and put smiles on faces by sending care packages addressed to individual Soldiers, Sailors, Airmen and Marines deployed in harm’s way. Freedom is Not Free is dedicated to assisting wounded service members and their families, and the families of the fallen. Operation Stand Down brings homeless veterans together in a single location and provides them access to community resources to begin addressing their individual problems and rebuilding their lives. Veterans Village San Diego is currently recruiting volunteers for Operation Stand Down San Diego on July 15, 2011 to support the more than 2,000 homeless military veterans in San Diego County.